Find Out What Your Home Would Sell For Today! When you sell with Dwellings by Rudy & Hall, you won't leave a penny on the closing table. On average when Sellers choose Dwellings by Rudy & Hall to assist them with selling their home they sell for 7% more than if they were to hire another brokerage. Your property is unique. It deserves to be marketed as such. We believe that no two properties are the same, each with a unique story. Our job is to tell this story and make you fall in love. We want you to fall head over heels and get swept off your feet by your own listing. Why? Because then buyers will do the same. Current tools & technology make it quite simple to list a property for sale. By entering information into the MLS system the average Real Estate Agent can automatically have their listings appear for sale online. We don’t do average. Ever. We certainly don’t do what ‘most’ Realtors do. We customize everything. We create an experience. A unique sales and marketing strategy is designed for every property. We think through the mind of the buyer. This custom marketing theme dictates everything from our content, photography and videography direction, staging & styling, online strategy, targeted marketing and events. Most people don’t know where to start to insure they get the best return on investment they have made in their home. In order to unlock any potential hidden equity in your home, your selling experience will begin with a through pre-sale consultation designed to give you a complete road map to quick, highly profitable and stress-free sale. Our highly-trained agents will inspect the home top to bottom and point out any cosmetic improvements or repairs that will increase the value of your home in a buyer’s eyes or save you money during the inspection process by addressing up front. If it won’t at least double your money, it won’t be suggested. This will help you make the best financial decisions in regards to your home. 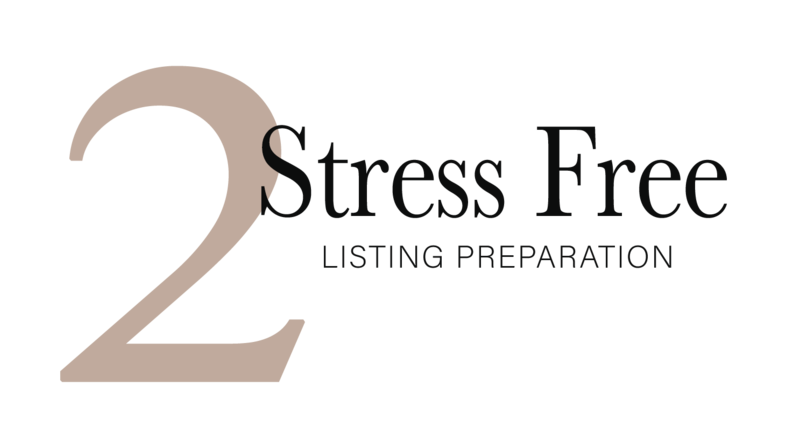 We know that selling your property can be stressful and time consuming. Your agent will ensure that your sale process is as seamless as possible. After a thorough Maximum Home Value Assessment, your real estate concierge will be pleased to help coordinate the execution of all tasks to help prepare your property to sell for the most money possible. From contractors and cleaners we will recommend licensed and insured professionals to insure your home shines with some of the best businesses in the area to bring you to decluttering or junk removal, we will help make it all happen, so you don’t have to. Ultimately, a successful sale relies heavily on how your property looks. To complement our marketing and sale strategy, we pay for the industry’s best staging consultants. They will assist you with what to pre-pack and what to do in order to showcase your home in the best light possible to potential buyers. Depersonalization, decluttering and proper staging will allow potential buyers to better picture themselves living in your home. First impressions count. 96% of buyers start their property search online and swipe through thousands of photos to find the ‘one’. Unfortunately, that can also make it harder for buyers to distinguish one listing from another. When you only have a split second to captivate a buyer’s attention and have your listing stand out from the rest, the photos have to stop them in their tracks. Professional photography, with a creative eye for every listing, is our standard. Our images are shot with wide-angle lenses, are high resolution and always unfiltered.The sellers accepted your offer, and the home is going through appraisal and inspection. The appraisal guarantees that the price of the property matches the condition of the property while the inspection makes sure that everything in the home is functioning properly and there are no major issues inside. These are the last steps before the shiny keys to your home are placed in your hand... for good! Our unique, custom property videos and 3D tours have a viral effect. By strategically targeting the potential buyer demographic for your listing, they will typically attract thousands of views. Our videos are professionally filmed and edited, always. By utilizing video and 3D tours we can highlight every aspect of the home and get buyers to spend more time engaging with the home. The more a buyer engages with a home online, the more likely they are to come and see it in person. Most agents don’t have a clue about how to market online. We own a social media marketing company that uses sophisticated online marketing and social media tools to target, track and convert buyers. For each and every property we determine the demographic profile of your potential buyer and run online campaigns that target them. We hyper-focus our ads (down to age, postal code and interests) to run campaigns that are put in front of prospective buyers multiple times and across many partner websites and search engines. Utilizing the industry’s best systems to host a campaign strategy that include coming soon ads, targeted and segmented email blasts, retargeting campaigns, just listed and open house postings. All of our print marketing pieces are custom designed, for every property. We work with professional graphic designers to create a consistent, polished and modern style for all of our print materials including glossy property brochures, flyers and signage for your lawn, neighbourhood and open houses. We spend the money to do it right so you sell for the most money possible. For every listing, we are committed to getting the word out about your property sale. In addition to our network, our agents reach out to surrounding owners and residents introducing them to the listing opportunity and generating buyer interest. Our expansive & rapidly growing network of buyer contacts will receive visually appealing online marketing about your listing. We maintain a thorough list of media & industry contacts to help ensure maximum exposure for your listing. We have carefully curated a Realtor network that is categorized by their typical buyer price points and neighborhoods. Our network spans outside the Metro Area throughout Michigan & the USA to potential international buyers. Our Open Houses are planned based on your property type and location! We aim to create buzz and strong interest in your property through strategic online marketing. In addition, our agents contact your neighbors and the surrounding area to invite them to the Open House and generate potential Buyer interest. Our sales and marketing strategy is designed with this end result in mind: to sell your property for the most amount of money, in the least amount of time, with zero hassle or stress. This is all part of making sure you don't leave a penny on the closing table. Selling your home is a big job. Metro Detroit sellers need to read this article before listing! There are 20 CRITICAL QUESTIONS you should be asking when hiring a Realtor. Get them NOW! Are you thinking of selling but feel overwhelmed? Get Dwellings by Rudy & Hall's free maximum home value assessment. This will net you thousands more at closing! See video of how Dwellings by Rudy & Hall markets their properties for sale in Metro Detroit. See how Dwellings by Rudy & Hall uses professional photography to showcase and market homes to sell for top dollar.